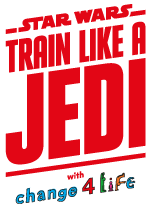 Get your school active with Train like a Jedi! Join Change4Life and Disney on an exciting journey through the Galaxy with the Star WarsTM inspired Train Like A Jedi programme for schools. Physical activity has been linked to better health, and social and academic outcomes, so inspire your pupils to move more and Train Like A Jedi with Change4Life. There are lots of ideas to get your whole school active using the Star WarsTM universe. Use them throughout the school day and keep them up every week to help your pupils stay active. Developed with teachers, the PE lessons outline the Train Like A Jedi moves, helping young people to improve their physical skills such as balance, agility and co-ordination, and inspiring them to be active beyond the lesson. For more information please visit Train like a Jedi.